In 1840, renowned English botanist George Gardner reported a strange sight from the streets of Vila de Natividade in Brazil: A group of boys playing with a glowing object that turned out to be a luminescent mushroom. They called it "flor-de-coco," and showed Gardner where it grew on decaying fronds at the base of a dwarf palm. Gardner sent the mushroom to the Kew Herbarium in England where it was described and named Agaricus gardneri in honor of its discoverer. The species was not seen again until 2009. San Francisco State University researcher Dennis Desjardin and colleagues have now collected new specimens of this forgotten mushroom and reclassified it as, Neonothopanus gardneri. Findings are now online and scheduled to be published in the November/December print issue of Mycologia. They hope that careful study of the Brazilian mushroomwhich shines brightly enough to read by--and its other bioluminescent cousins around the world will help answer the question of how and why some fungi glow. Desjardin, a professor in ecology and evolution in the SF State Biology Department and his colleagues determined that the mushroom should be placed in the genus Neonothopanus after carefully examining the mushroom's anatomy, physiology and genetic pedigree. But capturing new specimens of the mushroom to examine was a difficult task, Desjardin said, requiring a different approach than most fungi hunting. To catch the green glow of the bioluminescent mushroom, Desjardin and his long-time research partner in Brazil, Dr. Cassius Stevani, had to "go out on new moon nights and stumble around in the forest, running into trees," he recalled, wary of nearby poisonous snakes and prowling jaguars. But he said advances such as digital cameras have made it easier to track down bioluminescent fungi. 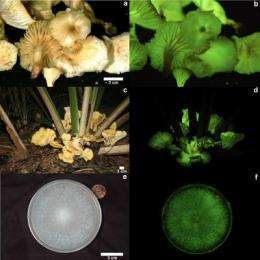 New cameras allow researchers to photograph mushrooms that they suspect might be bioluminescent in darkened rooms and analyze the photos for a glow (sometimes one that's not visible to the human eye) within a few minutes, compared to the 30 to 40 minutes required of regular film exposure. Bioluminescencesimply the ability of organisms to produce light on their ownis a widespread phenomenon. Jellyfish and fireflies might be the most familiar bioluminescent creatures, but organisms from bacteria to fungi to insects and fish make their own glow through a variety of chemical processes. Bioluminescent fungi have been well-known for centuries, from the bright orange and poisonous jack o' lantern mushrooms to the phenomenon known as "foxfire," where the nutrient-sipping threads of the honey mushroom give off a faint but eerie glow in rotten logs. Glowing fungi have captured the imagination of cultures around the world, Desjardin said. "People are mostly afraid of them, calling them 'ghost mushrooms.'" But how does a fungus make its glowand why would it glow in the first place? It's a question that has fascinated Desjardin for some time. 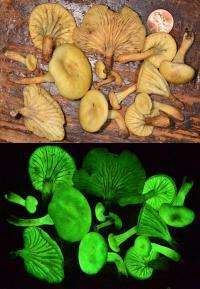 Researchers believe that the fungi make light in the same way that a firefly does, through a chemical mix of a luciferin compound and a luciferase. Luciferase is an enzyme that aids the interaction among luciferin, oxygen and water to produce a new compound that emits light. But scientists haven't yet identified the luciferin and luciferase in fungi. "They glow 24 hours a day, as long as water and oxygen are available," Desjardin explained. "But animals only produce this light in spurts. This tells us that the chemical that is acted upon by the enzyme in mushrooms has to be readily available and abundant." The why behind the glow also remains mostly a mystery. In mushrooms where the spore-bearing part glows, some scientists think the light may help attract insects that can help disperse the spores to grow new mushrooms. But in the case of foxfire, it's the threadlike mycelium, which seek out nutrients for the fungi, that do the glowing. Insects attracted to the mycelium might do more harm than good to the fungi if they ate the attractively lit structures. "We have no idea yet why this happens," Desjardin admitted. "Maybe the mycelium is glowing to attract the enemy of these insects, and will eat them before they can eat the mycelium. But we don't have any data to support this." Desjardin has collected and analyzed bioluminescent fungi from around the world, hoping to answer some of these questions. "We want to know how this happens, how it evolved, and if it evolved multiple times. Each one of these is a fascinating question that we are close to answering." I want my bio-luminescent tattoo! Sure, they found the bioluminescent mushrooms, but where's Jake Sully? They should engineer this to glow a lot more and use it in third world countries for lighting!! So... he took the mushroom to England illegaly? Why would it be illegal? The author mentioned a plausable mechanism as to why the mushrooms glow at night but it doesn't seem to add up to me. Very intersting research here. Mushrooms have been known to exhibit truly unique characteristics- some have been found growing near the Chernobyl site, harnessing the energy from the radiation... but glowing must consume a good portion of the energy of the mushroom, so it must have a good 'reason' to do so. Anyhow, I hope the researchers get to the bottom of this and share their findings.